Optional Single Supplement: $527 USD (number of singles limited). From the Renaissance grandeur of its buildings, the abundance of its art galleries and the romantic warmth of its Tuscan atmosphere, Florence is a city unique in style and attraction; there can be no more ideal a destination for our Northern Italy tour to experience the best of Northern Italy. After extensive exploration of this glittering metropolis, we set of on our journey into the heartland of Italy, stopping in at picturesque villages, admiring fortified buildings, touring regions famous for wines and hotsprings, investigating Roman ruins and visiting the Vatican. As we make our way towards Venice, the jewel in Italy's crown, we take time to explore Verona, the setting of Shakespeare's Romeo and Juliet, and learn about the country's intriguing history with trips to some of the Italy's innumerable historic sites of interest and museums. It was a most enjoyable vacation, seeing the highlights of a beautiful country, carefully selective tours and guides who broadened my knowledge. The pace of the tour was just right. We had a great tour guide, she was very helpful and very knowledgeable. Our bus driver was also excellent. He knew exactly where and when we where to be somewhere. He was a great driver and had wonderful manners. The evening meals were very nice. Good food. Overall it was a great experience. Thank you very much. A wonderful tour, with a very nice group of people. We appreciated having free time in the cities, so we could pursue our own interests, like climbing to the top of the Duomo in Florence, visiting several more mosaic sites in Ravenna, and visiting the inside of St. Mark's in Venice. Our tour guide was outgoing, likes people and treats tour participants and host country folks very well. A great tour !!! Lorna is very sensitive to clients needs & wants us to have a really good experience, which we did!! 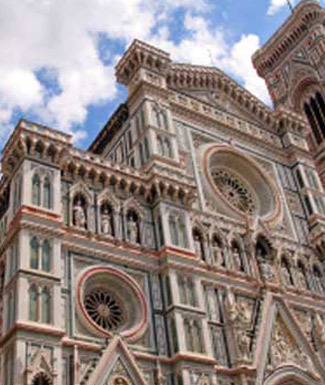 There is one word by which the world describes Florence, one word which anchors her in time and space: Renaissance. The first settlers were the Etruscans, and when the Romans founded Florentia in the century before the birth of Jesus Christ, they built a Forum that occupied the site of the present-day Piazza della Republica. Breakfast and dinner (mostly local restaurants) daily. All transport, accommodation, sightseeing and entrance fees for sites noted as 'visited' in the detailed itinerary. Gratuities for local guides, drivers, restaurant staff, porters. Airport transfers for land & air customers arriving/departing on tour dates. Transport throughout by private air-conditioned motor coach, 24-36 seats depending on ultimate group size (see 'group size'). Though we will have some full bus days, road travel is not particularly arduous as there are plenty of stops of interest and beautiful scenery along the way. Road are in good condition, though a little winding on some stretches. Well-located, air- conditioned, mid-range hotels and inns (3-star) used throughout. Some hotels are smaller properties (3-4 story) that may not have elevators. All hotels have en suite bath, though some may have shower only. Porter service is sometimes available (see 'inclusions') though you should be independent with your luggage. Single rooms are limited and likely smaller than twins. Tour Leader throughout, driver(s), local step-on guides in various locales.